Watershed needs to hear from just two more about cabin rental - Cabins 1 and 11. 888-604-3075 for Chris. Two days left - then after the close of business Tuesday they go open to the public. Ed has yet to hear from about a dozen guys about the amp kit final payments. Any day now Bob might want to know for sure how many sets of parts to order. Should I tell him that there are around 20 kits we aren't sure about? Just let me know and I'll get Ed (sea) the money ASAP. My final amp payment was sent out on Friday. Ed hould have it any day! 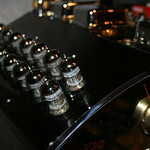 Gents - This post was not about amp kits - it was about cabins. Trying to get some response from just a couple of guys, from whom we've heard nothing in a long time, before they lose their options. Ahhhhh....ok. I thought it was about both. Sorry that I misconstrued the intent of your post. Cabin 1 is up for grabs, Janice and I will be MIA again as some last minute care issues have arisen regarding her mother and we will be taking care of her during Sept ,,sorry for the late post be we just found out. Ed and I deliberately arranged the amp-build payments so that nobody would have to pay for both cabins and amps in the same month. But we never figured on Watershed setting such an unprecedentedly late deadline – in past years the cabins had to have deposits down at least a couple of months earlier than this. Maybe they'll learn from this, and in the future do things as before. I can remember paying money down in March. Hopefully all will end well - all but a couple of the cabins are booked. We need to get the amp-build funds all squared away so that we can tell Bob if there is a reduction in the number he needs to order parts for. He has not been pushing for the amp money, but before any parts get ordered, we want to know if there are to be any dropouts. Earlier, it seemed to be the best idea to get him to produce as many kits as possible, since demand far exceeded his original projections. But that was before it became apparent that he was going to be selling under cost. Now we are looking at a situation where every kit not produced saves him some money. Speaking of Bob, today he's in San Diego, trying to get a customer's system to work properly. “Weak right channel” is the symptom; that won't stump him for long. I told him to try some of that graphene – at $10 a drop it should fix anything. Wow. Sure hope all the parts get ordered and delivered in time. Cutting it close. As for the cabins, everyone knows the deal. Doesnt matter what the deadline was, payment could have been done at anytime previous to it. Here is hoping we fill the mountain, but que sera sera. All I know is I'm looking forward to loading up the car and having some R and R. Been a particularly difficult year and may be my last vacation of this duration. Cant wait to see my CF sisters.